In early 1985 I searched South Florida for a place to set up a small informal boatyard—really just a place to build my newly-designed Exuma 44 cat schooner in cold-molded wood. Camping out with a group of friends in the Keys, I found an overgrown, deserted property on the south shore of Windley Key (Islamorada) that seemed perfect. It had about three acres, a ruined fish-camp shack, a 100′ canal and concrete dock, and no neighbors on either side. The land was on a stretch of old A1A that ran parallel to the Overseas Highway, and was therefore quiet and isolated, having virtually no traffic. My kind of place! The fishing camp in Islamorada, Florida Keys, as we found it. With some research, I contacted the owners of the property and was able to lease it for very little money, on the grounds that I would make repairs, re-connect utilities and clear the overgrown brush. This I did, quickly and inexpensively. Because the shack was pretty uninhabitable (it did have a kitchen area and a very rough bathroom), we elected to pitch tents on platforms on the two points of land that extended out into the tide-flats facing south toward the Gulf Stream. The points were on each side of the canal, for privacy. We repaired the bathroom and kitchen, replaced some doors and windows in the shack, repaired roof leaks, got the utilities working, and commenced building what would become the prototype Exuma 44 TERESA DE ISLA MORADA. The Exuma 44 cat schooner TERESA in frame, with the tool shed and shack behind; Teresa Rodriguez is working on the keel center-plank. For a shop area, we built a quick-and-dirty shed from 2x4s and poly tarps. I had my tool trailer, with opening sides, dubbed “The Taco Stand,” because that’s what it looked like. We built a strongback outdoors in the yard, and built TERESA’s hull under the sun and stars. This worked perfectly until we finished the hull and righted it, exposing the inside to sun and rain. To cover and protect the righted hull, and to provide shade for us boatbuilders, I made a quick scale drawing on a piece of scrap plywood and handed it to Jill Coconaugher, one of my three female boatbuilders. Jill has one of the highest degrees of space-consciousness, structure, form and proportion, of all the people I have ever worked with. She could build almost anything, and was learning as she went (she built several large boats with me between 1985 and 1994). The girls (I know—they really should be called women) cut out the plywood gussets and cut the correct angles on the ends of the 2x4 posts and rafters. Stacking the “bents” (frames) on top of eachother, they nailed the gussets to the timbers. Jill nailing on plywood gussets for the five shed “bents”. Sholeh and Jill assembling the bents. After assembling the bents, the girls stood the middle one up, using braces to hold it upright. Sholeh and Jill then slid the ridge pole over the first bent. After raising and bracing the first bent, Jill and Sholeh slid the ridge pole in place. Subsequent bents were stood up in place under the ridge beam. Posts and braces were staked to the ground using rebar, which was wired in place. The assembled frame, ready for covering. The third female boatbuilder (and shed-builder) was my long-term Cuban friend and sailing companion (first mate) Teresa Rodriguez, for whom the first Exuma 44 was named. The finished shed, sheltering TERESA, whose deck is in frame (Note the tent in the background, in which three of us lived). A large tan-colored poly tarp was stretched over the frame, secured by stapled-on battens (using an industrial pneumatic staple gun). At times, additional tarps were hung from the sides or ends for additional shelter as required. We finished TERESA in the late spring of that year, having built the entire boat in less than six months, and took her by truck to Point Judith Marina. 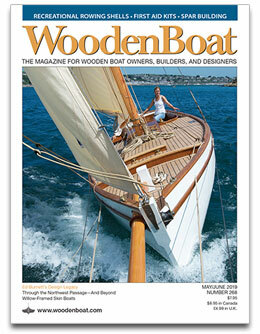 We launched her just in time to sail her to the WoodenBoat Show in Newport, Rhode Island, in 1985. The Exuma 44 TERESA DE ISLA MORADA en route to the 1985 WoodenBoat Show. Get that fender up!